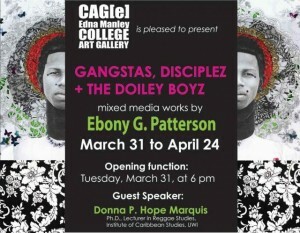 Here’s an interesting video interview with a young Jamaican artist, Ebony G. Patterson who recently had an exhibition entitled “Gangstas, Disciplez + Doiley Boyz” which recently closed at the CAGe gallery, Edna Manley College. Petrine Archer-Straw interviewed Ebony about her work and had this to say about the interview in her blog, “Diaspora Dialogs went to preview her show and to interview her about her continued interest in Jamaican dance hall culture. Her interview is great material for teaching about what’s new in contemporary Caribbean art. She’s articulate, inspiring and enthusiastic. Ebony’s images imaginatively recreate portraits of young black males who bleach their skin, pluck their eyebrows and wear ‘bling’ jewellery to enhance their gangsta status. Ebony finds beauty in their psychic violence glamourizing them with glittered halos and luscious lipstick”. I am a student of The MaryMount High school High gate in St.Mary Jamaica and i am currently doing an Art school based assignment on your inspirational work. I am creating a reflective journal that should contain a Jamaican artist that majors in my chosen art work or form, which is mixed media. I would really like to get in contact with you to find out more about what inspires your interesting art work. please contact me as soon as you can. any more exhibitions coming up soon? I am currently writing a thesis on Jamaican trans-national identities, using Dancehall as a metaphor of that experience. I would be very grateful if we were able to talk some more about your work and your ideas about Diaspora, etc. My email is listed in the address bar above, as well as my blog. Hoping to hear from you! This is great! Wonderful to have a coming together of art, dancehall and diaporic issues in one place!